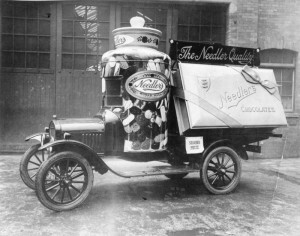 Needler’s was one of the largest regional confectionery firms in Britain. Fred Needler (1865 – 1932) was born in Arnold, a hamlet in the East Riding of Yorkshire, about nine miles outside Hull. He became general assistant to a small confectioner on Osborne Street, Hull in 1881. 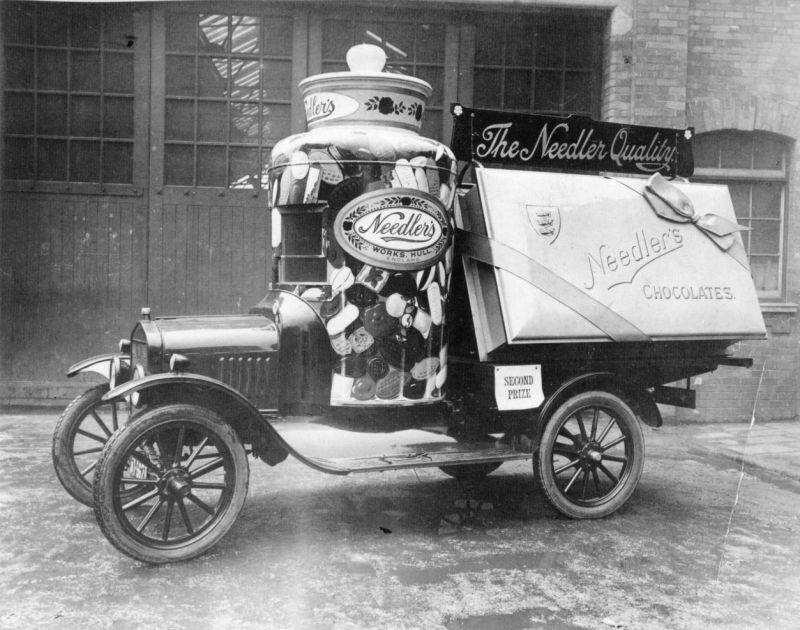 When the business failed in 1886, Needler borrowed £100 to buy the equipment and establish his own confectionery business at nearby Hanover Square. Initially working 15.5 hour days, he manufactured chocolate and boiled sweets. Needler relocated to larger premises on Brook Street in 1890. By this time around ten people were employed. The premises were removed to Spring Street in 1896. The business was registered as Fred Needler Ltd in 1902. The company directors were recruited from Needler’s staff of 50. The company relocated to a new factory on Sculcoates Lane from 1906, and changed its name to Needlers Ltd.
Needler was a staunch Methodist, and was guided by three principles: honesty, quality and fair treatment of his workforce. From the beginning there was an extensive profit-sharing scheme for staff. The company also covered sick pay and early retirement due to illness. Two holiday homes were established in seaside resorts. Newly-wed female employees were awarded a “dowry”. The company employed over 1,400 people by 1924. The Prince of Wales toured the factory in 1926. Sales outlets were opened in Newcastle and London in 1929. Needlers opened a 6.5 acre recreation ground adjacent to its works for the use of its staff in 1930. Fred Needler died in 1932 with an estate valued at £147,596. He had donated generously to local charities throughout his life. By this time Needlers was one of the largest businesses in Hull, with 2,000 employees. Needler was succeeded by his son, Arthur Percival Needler (1900 – 1976). The company struggled during the Great Depression. Needler chemists discovered a method to produce clear (or glace) fruit drops by adding lactic acid in 1938. The glace drop was to prove a major success for the company. A P Needler retired in 1970 and was succeeded by his son, Raymond F Needler. Needlers immediately acquired Batger & Co, a London toffee manufacturer, and centralised all production at Hull. Following the acquisition, Needlers employed 750 people. Needlers experienced mixed success throughout the 1970s, and was steadily loss-making by the early 1980s. A shift in public tastes from sugar confectionery to chocolate was blamed. To reduce costs, a large number of low-margin, low-volume product lines were discontinued in 1977, and the workforce was downsized from 750 to 400. Increased exports and private-label contracts allowed Needler to re-enter profitability in 1984. The company was acquired by Hillsdown Holdings for £3.4 million the following year. Needler failed to invest in modern machinery, and entered a period of steady decline. Needler was acquired by Blue Bird Confectionery for £3.85 million in 1996. According to research by Candy Industry magazine, Blue Bird Confectionery had an annual turnover of $66 million and 120 employees in 2000. Ashbury Confectionery of Corby, a leading own-label chocolate manufacturer, acquired Blue Bird in 2001. The Hull factory was closed the following year. Ashbury Confectionery entered administration in 2015, and was acquired by Baronie, a Belgian chocolate manufacturer. Needler branded chocolates are still produced as of 2018.